`Jesus took bread and blessed it, and broke it, and gave it to his disciples, and said' "Take, eat, this is my body".' Matthew is written in a rhythmical and often poetic prose. It is the gospel best suited for public reading, and, as a result, it is probably the best known: It tells the story of Christ's infancy; the Sermon on the Mount; the parables of the wheat and the tares; the sheep and the goats; and the Resurrection. William Barclay's insightful commentary brings freshness to these familiar passages and uncovers the vivid depth of meaning often lost in translation and repetition. 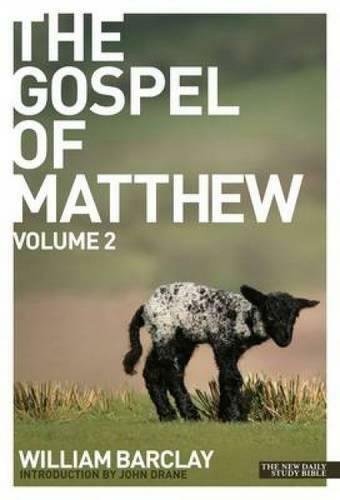 In this second volume examining the Gospel of Matthew, discover again the miracles, the parables and the Resurrection of Jesus. William Barclay's world-renowned down-to-earth New Daily Study Bible commentaries - including his own translations of the New Testament texts - have inspired millions of people across the generations 'to know better their Bible, their God and their Saviour'.